Before starting your kitchen remodel it’s important to have all of your basics lined up in a row. This kitchen remodel checklist includes all components necessary to complete a successful kitchen remodel. Project specifications are the first thing you need to address for your kitchen remodel checklist. This includes total square footage of current kitchen as well as intended square footage after remodel. Make sure to include your overall budget and any project deadlines. When setting a budget for a kitchen remodel always set aside at least 15% for unexpected events. How much does your current kitchen need to change in order to be considered functional? Do any walls need to be removed or added, any major appliances relocated? Assess how much you like the overall layout, does it need to be changed completely or can it keep its same shape? Do you want more cooking/countertop space, or are you satisfied with the available space? You can ask the same questions in regards to cabinet space, number of ovens and fridge size. All in all, this is your list of the things you want changed. Don’t forget to consider if you want a completely new kitchen layout. Galley, U-shape, island, G-shape, one wall, or L-shape. Depending on the size and shape of the space the best option will vary. Design Time: What Colors & Style Are You Going For? 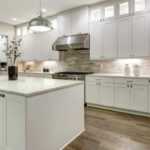 Every good kitchen remodel checklist includes a design, starting with the overall look you are aiming to achieve, such as, period, cottage, modern or rustic. What is going to go on the walls, paint, tiling, granite, etc.? Take note of the materials you plan to use for the backsplash, how will this material play up the theme and style of your kitchen? Make note of all paint colors you plan to use. Are you replacing any windows (from window coverings to new window screens)? Include the number of doors that need to be replaced, as well as the style door(s) you’d like to switch them out for. Will you add an over the stove hood? What sort of sink style are you going for? Use the right style of faucet to play up that look. 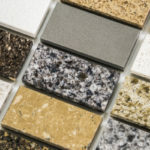 What type of countertop materials do you plan to use? Will you go with the longevity of granite? In terms of countertops, make note of material, color and edging. Know the exact number of cabinets needed, as well as the dimensions of each cabinet. What type of cabinets do you want in regards to color, type of wood, knobs and overall style? Are you buying new cabinets or restoring old cabinets? What type of floors are you putting in; hardwood, ceramic tile, vinyl, etc.? How much square footage do you need of these materials? Last but not least, take note of any and all appliances. What appliances do you need to purchase? Where will they go? If appliances are relocating you may need to consider the costs of plumbing or electrical work. Pay close attention to the style and dimensions of the stove, refrigerator, oven, microwave and hood. As well as any other appliances a remodel includes. What type of sink do you want? Single or double bowl, coated cast iron, composite or granite engineered stone? Different sinks come with unique features such as a sprayer faucet, garbage disposal or filtered water dispenser. Will any of these features add value to your life? What type of lighting are you adding? Track or recessed? 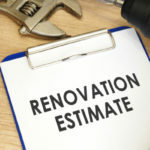 All of these features can dramatically increase or decrease the overall cost of a remodel. 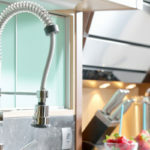 Keep an open mind, you may find changing around a few of these features gives you the flexibility to go all out in other areas that add more overall value to your kitchen. Once your checklist is complete it’s time to ensure you or your contractor has pulled all of the required permits. Plans must be drawn up by a professional and approved according to local building codes. At this time, you have a set budget to stick to and secured the funds necessary to pay for it. A detailed timeline and any deadlines must also be established. Create all timelines with the realistic knowledge that the only thing certain is that something could go wrong. Don’t forget to save money by buying wholesale kitchen cabinets, countertops and more from Tops Kitchen Cabinet!